Actvity Summary: Students will be able to calculate drilling rates over a three-day period during Expedition 309 by using the data provided. Composition, structure, fracturing, and other factors may influence the length of time required for drilling through oceanic crust. 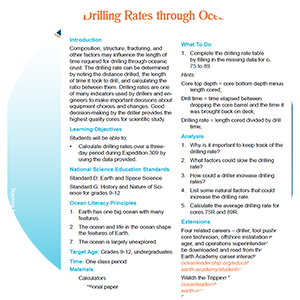 The drilling rate can be determined by noting the distance drilled, the length of time it took to drill, and calculating the ratio between them. Drilling rates are one of many indicators used by drillers and engineers to make important decisions about equipment choices and changes. Good decision-making by the driller provides the highest quality cores for scientific study.